There are way too many good advertising books out there for one person to read in a lifetime. But some are too good to miss. 10 absolute must-reads are listed here, and they are required reading for anyone, in any aspect of advertising, marketing or design. However, those are just the tip of the iceberg. Here are another 7 advertising, marketing and design books that you should pop on your reading list. They’re also great gifts for the creative people in your life. 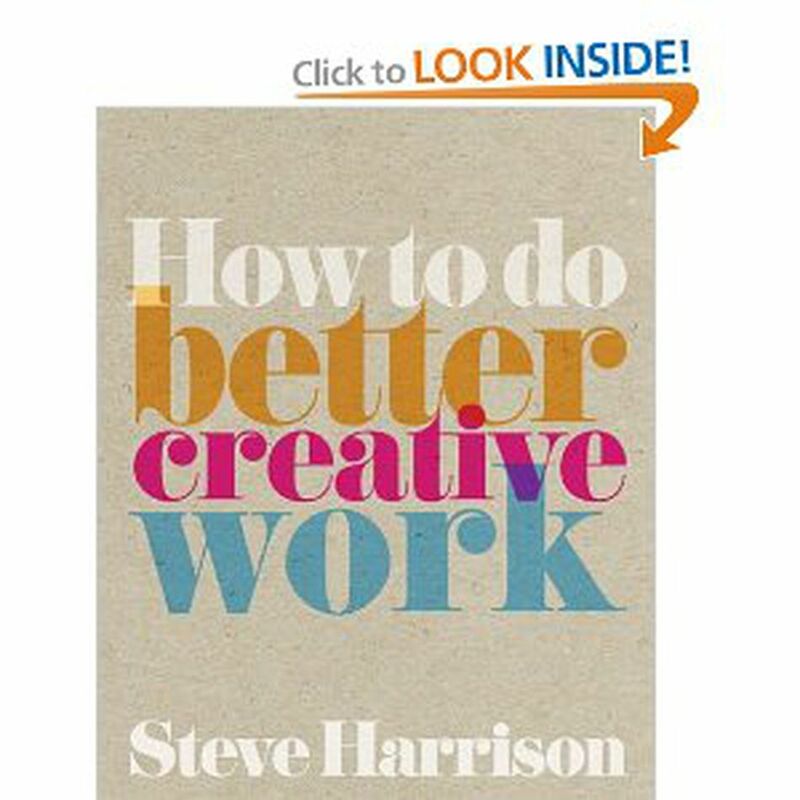 I have a particular fondness for this book because I was lucky enough to work under Steve Harrison in London. To this day, over a decade later, I still find myself parroting Steve's words to other people, and correcting my copy over and over again. The time I spent with Steve, one of the best creative directors in the business, was priceless. The reason is simple; Steve cuts through the bull and gives it to you straight. What's more, he doesn't just explain the problems, but offers skillful solutions. In the book, you'll learn what it takes to be an effective creative, which means coming up with great ideas that actually sell. He also explains the principles of brand-building, creative presentations, how to be a creative director and how to run a successful business. It's all done in a way that's both easy to read, and impossible to forget. Filled with examples of some of the best advertising and direct marketing (often overlooked by the snobs of the industry), this is essential reading. This is now on record as being the most expensive book on advertising ever sold, with prices hitting over £3,400 a copy. That's over $4,000 at the current exchange rate. Since then, things have calmed down, but it's still only available from private sellers for around the $100 mark. And it is worth every red cent. Trott is a living legend in the advertising business, with a sharp mind and an even sharper tongue. He's not afraid to tell it like it is, and sometimes his words feel like a smack around the earlobe. But a well-deserved one. He opened one of the most anti-establishment ad agencies of the 1980s - GGT. Its work was so breakthrough and unavoidable, it even got death threats from the Ayatollah Khomeini and some unwanted attention from the Kray twins. Now, in Creative Mischief, the master of mayhem tells you how to do advertising the right way and run an ad agency. You'll learn about the importance of making sure your advertising gets noticed (which seems odd to say, but so few ads actually do breakthrough the clutter). You'll find out how to make ads memorable. And you'll have a ton of laughs in the process. A great book, highly recommended. A founding partner of Bartle Bogle Hegarty, one of the world's most influential and important advertising agencies, John Hegarty is an icon. Now, he shares what he has learned about advertising, design, London and everything in between. As Hegarty is no fan of copy (he's famously said "words are a barrier to communication") it must have been tough for him to fill a book full of it. But he does it with real style, humor and irreverence. And if you're in any business that involves advertising, you'll find it a book that you find difficult to put down. In particular, the chapter on how to be a creative director is golden. It's short, to the point and demands multiple reads. Get this book. Buy copies for friends. One of the greatest living copywriters, Neil French got into advertising the old fashioned way; namely, he just fell into it when no other professions suited him. Lucky for us he turned out to be a fantastic writer who can twist copy and prose like an Olympic gymnast. The book charts Neil's life and career, with chapters devoted to his stint as a bullfighter, his time spent in account management, the formation of his first ad agency, and the subsequent controversies that surrounded him. As much an autobiography as it is a manual on advertising, it's both funny and cutting in equal measure. At $50 it's not cheap, but for the wisdom is provides, it's a steal. An updated and redesigned edition of the original D&AD Copy Book, which went out of print long ago, this new version now includes work produced in the last 15 years. As with its predecessor, the book contains essays by some of the best copywriters in the advertising industry. They include David Abbott, Lionel Hunt, Steve Hayden, Dan Wieden, Neil French, Mike Lescarbeau, Adrian Holmes, and Barbara Nokes. Each copywriting superstar reveals how they work, why they do what they do, and how you can be a better writer or creative. It's also filled with dozens of examples of their work. Buy this, refer to it often, be inspired, and maybe one day you'll grace the pages of the next edition. Another book by Dave Trott? Yes. In fact, every book ever written by the great Mr. Trott is a must read, and this one is no exception. Dave can weave a story with the perfect amount of humor and insight, and it makes reading his books an absolute breeze. In fact, if you have a weekend free, you'll finish this one with ease, and go back and read it again. Filled with incredible stories from his career, plus prime examples from history, this is a masterclass in creative thinking, and lateral problem-solving. And everyone who reads this book suddenly finds themselves inspired to do better work, and do more of it. It's not just a fire starter, it's a nuclear catalyst. Ignore this at your own peril. Chances are, you won't have heard much, if anything, about the late great Howard Gossage. To say he was a tremendous influence on modern advertising would be akin to saying The Beatles were a somewhat inspiring to a generation. Gossage was not an ad man in the traditional sense. He was certainly not someone as that was as easy to pin down as Bill Bernbach or Leo Burnett, who were masters of their craft, but focused on a particular type of communication. Gossage was a writer, a thinker, a philosopher, and he was decades ahead of his time. In fact, many of the techniques we use today in guerrilla, social media, and interactive advertising can be traced back to his methodologies. He was a brilliant man. And writing about him, another brilliant man - Steve Harrison. Having won more Cannes Direct Lions than any other person on this planet, he knows his stuff. Get this book.